This traditional cafe is one of those historic places whose stylish old fashioned decor comes across as chic, and ends up with posh customers, even though it was once decidedly working-class, with its dark wood panelling, marble-topped tables and bare planks and sawdust on the floor. When I dropped by for a late-afternoon coffee it was pleasantly empty and without music, which is a nice change. The lunch menu, one side in Limburgs and the other in Dutch, has a fairly convention split of dishes - soup, sandwiches, hot meals and 'appelvlaoj'. I must come back when I'm hungry. This used to be one of Maastricht's better eetcafes, being much more down to earth than the others crowded along this side of the Vrijthof. Unfortunately, someone seems to have let a designer loose on the place and ripped its soul out, leaving a stylish but cold-looking interior. We ran a mile when we saw this, so a full-report will have to wait for another day. Cafe Zuid is one of the new cafes at Ceramique whose showpiece terrace, and its view across and down the river, will certainly be full up whenevr the sun is out. Unfortunately, our first visit was marred by dreadfully slow service; we waited more than ten minutes to order, and the same again for drinks to arrive. Perhaps this was a one off, but untill I hear otherwise I won't be back in a hurry. It is only appropriate that Céramique, in keeping with its grand open spaces and bold modern style, has a cafe both modern and stylish. 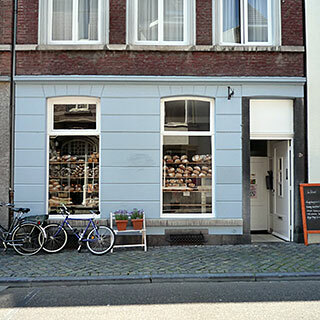 The exceptionally austere style will probably appeal to Maastricht's nouveau-yuppie crowd - bare concrete high ceilings and exposed ducts, with sombre grey and dark brown decor and furniture whose end result is more relaxing than oppressive. Apart from being literally at the other end of the new footbridge, all of this makes Coffeelovers completely different to De Bobbel, say. Except that both are somewhat posh, but then that's Maastricht for you. 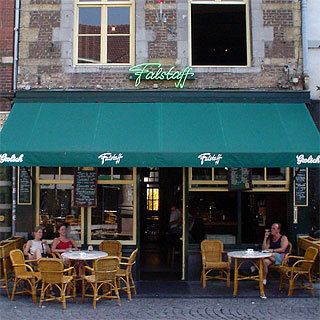 This is probably the best place in town to sit outside and drink beer on a sunny afternoon, because this little square avoids the crowds and pretention of the Vrijthof and 'leafyplein' (Onze Lieve Vrouweplein). If you can get a table upstairs it's also a very pleasant place for a drink in the evening. 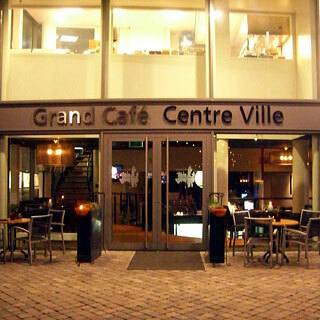 Grand Café Centre Ville is a riverside cafe that is part of the new development around the market square. New cafes tend to be a mixed bag, but this one has plenty to recommend it. The modern decor is tastefully minimalist but stops short of losing all character and has some warm touches - most notably the comfy chairs by the window. The mellow music, meanwhile, matches the understated looks and makes this a great place to hang around over coffee. We were sufficiently intrigued by the menu to stay for dinner, and enjoyed a decent meal. The menu is mostly standard stuff, with a few more interesting options and plenty of choice. The food itself was good, without being too adventurous, which is a welcome change compared to the new places that try too hard to show off, fail to pull it off and mess up the basics. Peculiarity: the first floor kitchen has large exterior windows as well as an interior window to peer through on the way to the toilet. That must be far more pleasant to work in than the normal hothouse dungeon. 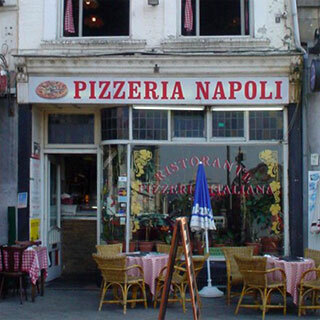 This Italian family-run down to earth student favourite (there's a 20 per cent discount) is a great place for pizza, which makes up for the over-the-top Italian nick-nacks and decor. 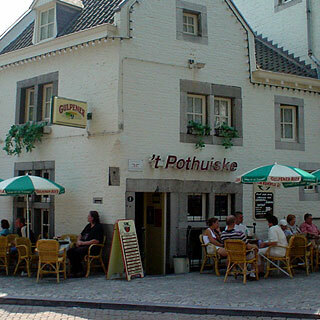 Cafe 't Pothuiske is definitely not cool - the tacky music shares the same seventies style as some of the customers' haircuts and the interior is more 'dated' than 'retro'. 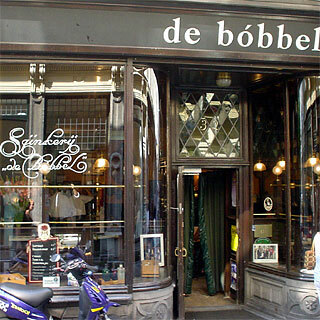 However, this place is well worth a visit for its excellent selection of draught beers and its traditional food. The goulash soup and the onion soup are both good, and there are several selections of cheeses and cold meets to go with your drinks. The hot chocolate is allegedly worth a try too. This place's out of the way location near the the university makes it a student bar in term-time and quiet tourist-free haven in the summer. The small dingy bar fills up easily, and always has a sociable atmosphere for drinking. You can eat too; the onion soup is reportedly the best in town, although I find it hard to believe that it could be better than the one at In 't Knijpke. The only thing wrong with this place is that I can't pronounce the name, so I have problems recommending it to friends. 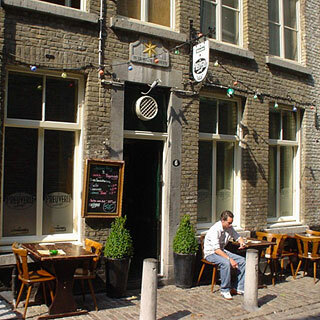 A while ago the tediously poor traditional De Gijs was reinvented as this more more interesting bar, which has bold decor and plenty of character. 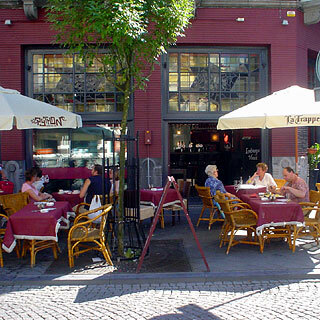 The terrance remains a popular spot, although there is a fair amount of traffic on the street, but it is not bad. Inside, the dark furniture and black-and-red walls give off mixed signals about the style of the place, as does the eighties music, so we cannot guess what kind of crowd the evening will bring. 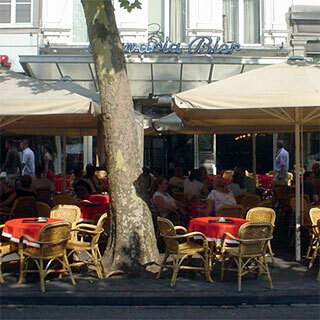 The menu has a very wide selection of sandwiches, soups, tapas, salads and meals, which are probably worth a try. The main annoyance, however, is the scheme where you wait for your order to be announced on the TV screeens and pick it up from the kitchen yourself. Perhaps someone really thinks this is cool or wants to recreate part of the McDonalds or post-office queue experience, but we think it is all rather poor, and a sure route to lukewarm food. After all, they even bring you your food in an English pub, and it is not like the food is really cheap or anything. Recommendation: go somewhere else - this place is inexcusably bad. Le Salonard is not actually a cafe, but has such good delicacies that stocking up here for a picnic and going to the park could just be the best lunch on offer. Our first visit produced a fairly innocent-looking sausage roll that was actually a gourmet truffle experience. We will certainly be back for quiches and cake. Recommendation: take an empty picnic hamper, wine glasses and a corkscrew, and go to the park. If we are really lucky, they will have a table or two and a coffee machine by then. Last visit: 14 August 2010. 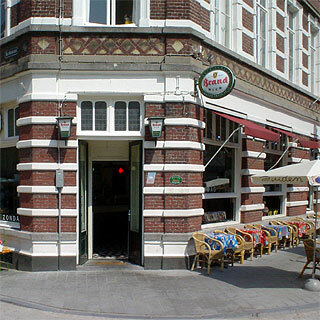 One of the better bars on the Wyck side of the river, Zondag is an unusual cafe that is bold with both its decor and its loud but cool music. 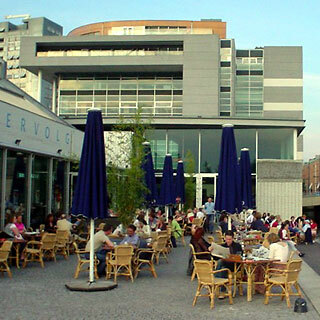 This makes a nice change if you don't worship terraces and want to sit at the bar for a drink, and seems to appeal to the thirty-somethings who wouldn't go near the likes of de Bobbel across the river. 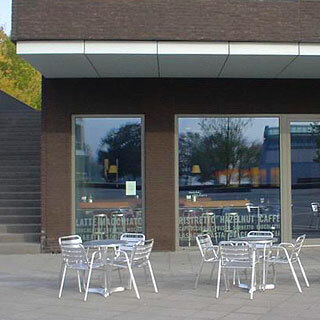 Indeed, Zondag does well to create an easy-going atmosphere and avoid being pretentious or boring. On one visit we went to Zondag on Saturday, but it was late-afternoon and there wasn't even room to sit at the bar. Still we wouldn't have stayed anyway because the smoke was really thick, which is a shame. The next time was a Thursday lunchtime in June, with lots of room, an open door and no smoke. I'd have spent the whole afternoon there if I had time. This time we discovered the excellent sandwiches - I loved my crusty white roll with Serranoham, cream cheese and red onions (€4.50).